And last night for dinner I used up the rest of the chili. This is one of those recipes that you can’t believe it is vegan because it is so cheesy, melty, tastes like you should be eating it at a Superbowl party. Actually the last part is true, if you must go to a Superbowl party you should bring this. Don’t share with the non-vegans, you don’t want them to know our secrets. This version I used up leftover chili and homemade re-fried beans. You can also use cans of both which also tastes pretty darn good. I also had some vegan cheese left over from making vegan chili cheese dip for New Year’s eve, but you could go without if that isn’t your thing. It won’t be as good, but still worth it. I usually make this in the oven, but last night I used my slow cooker while we were out climbing. I used exactly the same recipe and cooked it for 2 1/2 hours on high. It turned out really well. One warning, it is very easy for two people to sit down and eat this whole recipe, so I recommend taking very small portions so you can go back for seconds and thirds without actually eating that much. Also reminding yourself you want it for lunch tomorrow can help. Just be careful. I’m not sure what to call this Chili Cheese Bean Casserole is the descriptive name. It could also be Mexican lasagna, tortilla bake, layers of happy. I don’t know. If you have a name let me know. pour one can of tomato sauce in a 8″ round baking pan or pie plate. spread half the re-fried beans on tortilla and grate a little cheese over them. Place another tortilla and half the chili on those and grate a little more cheese on top. Layer another tortilla, the other half of the beans and more cheese on those. Layer another tortilla, the other half of the chili and more cheese on that. 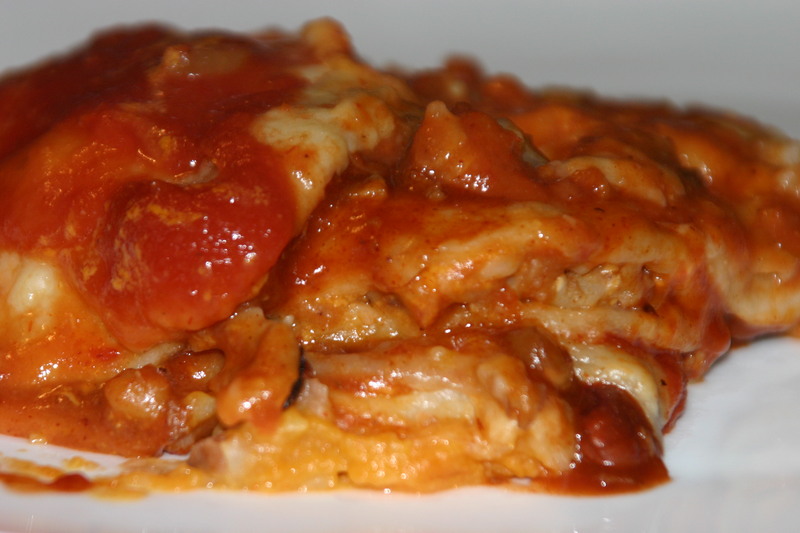 Top with the final tortilla, the other can of tomato sauce and more cheese. Cover with aluminum foil and bake at 350F for about 30 min until the cheese is melted and the casserole is heated through. this is one where you just want to eat more! I love the chilli bean casserole!